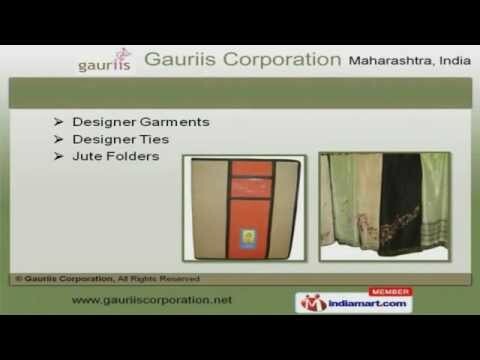 Welcome to Gauriis Corporation, Manufacturer and Exporter of Jute, Cotton and Non Woven Fabric Bags. The company was established in 2011 at Nashik. Our Efficient logistics facilities help us to Cater to Indian Sub Continents and East Europe. Sula Wines and Bilz Germany are some of our prestigious clients and we are backed by Attractive designs and vibrant colors. We offer a huge gamut of Non Woven, Cotton Carry and Jute Bags. Laundry, Eco Friendly Bags and Designer Hand Painted Sarees offered by us are widely acclaimed in the market. Our Designer Garments, Ties and Jute Folders are extremely reliable. Our Clamping Elements and Tool Making Moulds are in huge demand across the global markets. We have gained tremendous expertise in providing Ground Plates and Mould Base that are highly efficient. Our Industrial Nuts and Carry Bags Printing Services are a class apart.